North Korea's architecture is truly fascinating, influenced by the need to rebuild Pyongyang in the wake of the Korean War and the nation's relative isolation. What happens when an architect who has never been outside North Korea designs futuristic buildings to accommodate tourists visiting their country? Top Image: A Self-Sustaining Silk Cooperative, Credit: Koryo Group. Koryo Tours has been bringing travelers to North Korea since 1993 and promotes cultural exchange between North Korea and other countries. Koryo Tours founder Nick Bonner recently commissioned an architect to create a series of designs imagining how a future North Korea might accommodate a huge influx of tourists. The images are part of the Golden Lion-winning Korean Pavilion at the Venice Biennale and are on show until November. Image: Mountain Conical Hotels, with ski runs in the pipes connecting the buildings, Credit: Koryo Group. If you're interested in experiencing North Korea's architecture first-hand, Koryo Tours is leading an architecture tour through Pyongyang from October 25th-November 1st. You can read more about the tour at the Koryo Tours website. What was the impetus behind this project? How did you go about selecting an architect to create these designs? Nick Bonner: I was trained as a landscape architect and first visited Pyongyang in 1993. That same year, I set up Koryo Tours, a travel company that specialises in travel to North Korea, and have basically been in the country every month since then. We are based in Beijing, which has changed beyond belief in such a short space of time, but sadly it is nothing special, whereas as soon as you set eyes on Pyongyang, you realise what an unusual city it is – visually fascinating structures built to reinforce its political ideology. Image: Hotel for the port city Nampo, Credit: Koryo Group. Pyongyang was flattened in the Korean War and rebuilt as a "socialist utopia" (reportedly Ceausescu was so impressed by the architecture after a state visit in 1971 that he sent his architects over to Pyongyang on a study tour). It is a city that reflects its socialist ideals and you are never too far away from the ideology, whether in the form of propaganda posters and mosaics on the streets, or the monumental scale of the sculptures that tower above you. I spent a year teaching landscape architecture to first-year students at Leeds Metropolitan University in England, and the experience of seeing students develop their own briefs and designs is always something that has appealed to me. I wanted to meet a North Korean architect and see how he or she would visualise the growth of tourism in his or her own country, with an environmental and sustainable approach. The project grew from there and, after finally meeting with architects in North Korea, I decided the way ahead was to commission concept designs for a sustainable future in tourism. Image: A pedestrian bridge would let travelers walk through the mist of the Diamond Mountains, Credit: Koryo Group. 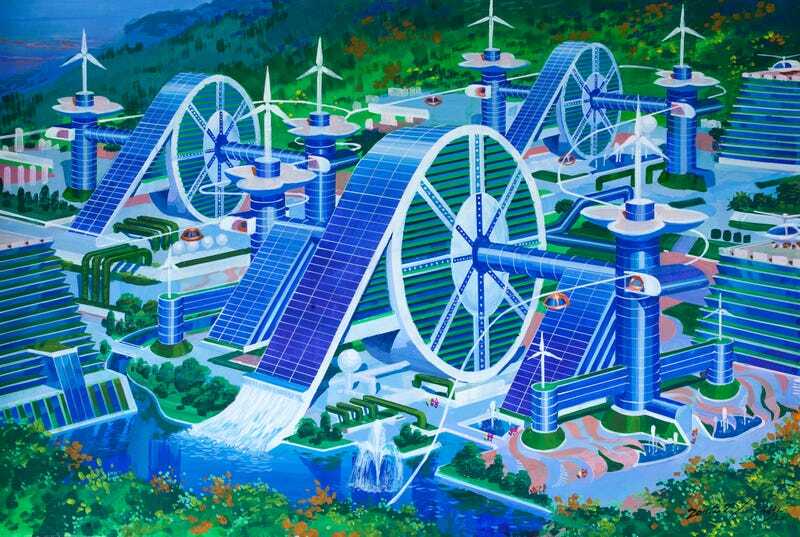 Many buildings in North Korea have what we in the West would call a retro-futuristic feel, so something that we have seen before, except this time we were pushing the eco side of it all. The project was commissioned in-house – an experiment between Koryo Tours and the North Korean architects, and looking at the future of sustainable tourism. When we started taking the first tours to North Korea in 1993, only a small handful of people were visiting, but now we take over 2,000 a year (more than half of all the foreigners who visit). It still remains the least-visited country in the world, but also one of the most interesting experiences possible. Image: An "Aerial Hotel" that allows guests to enjoy views of nature, Credit: Koryo Group. We gave the architect the challenge that if tourism really did become popular then how would they cope with the necessary development without destroying the landscape. We came to the conclusion that we wanted to use local building materials and techniques where possible. Over 80 per cent of North Korea is mountainous, and it has two beautiful coastlines; under different circumstances it would already be a hugely popular destination, particularly for those living in the Chinese provinces that border with North Korea, and do not have anything as beautiful. The majority of architects are trained at the Pyongyang Construction and Building Material University, and all work for the government. There are no private projects. The architect we partnered with on this project was working for an Asian company for a five-year period when we first met. It was through him that we were able to get access. Image:A tree-shaped hotel at Mount Kumgang, Credit: Koryo Group. If the architects are relatively unfamiliar with modern architecture and technology outside of North Korea, what are their key influences? What were their goals in imagining these particular buildings? Nick Bonner: North Korean architects, like any architects, have imagination and skill, so I was not surprised to see the variety of work that was produced, albeit of a similar retro-futuristic style. You only need to walk around Pyongyang to see buildings that express originality within the limitations of what is allowed there, and what is actually achievable in terms of the available technology (for example, no glass-curtain walls, and most buildings still built with concrete and reinforcement bars). Villas overlooking a waterfall near Mount Kumgang, Credit: Koryo Group. They might not be aware of the latest cutting-edge technology, but they do have an idea of what is going on in the outside world – although perhaps not in detail. If you look at the designs, they use wood and traditional construction methods in imaginative ways, reusing natural products in a traditional way (making use of natural cooling, structural strength by laminating wood, and so on). In other ways, they have imagined sheets of glass that capture solar energy to moderate a building's temperature, and, where possible, to store energy – they may not have this exact technology, but they know it exists or will exist in the future. Ultimately, they were given a blank sheet to build a future for an increase in tourism. There were no constraints or examples given – they were free to express themselves as they wanted. These buildings are meant to represent the future of travel. What kind of amenities does the architect imagine? What amenities currently exist for travelers in North Korea? Elements of this project that I find particularly interesting are where the designs reflect the country's politics – the combination of architecture and socialism. Take, for example, the social space in the Bird's Nest Villa, where you come out of your room and are meant to interact with your fellow guests, or the Silk Co-Op, where workers and tourists intermingle, both having valuable social exchanges. Koreans are probably some of the proudest people on the planet, so there is also much reference here to their traditional architecture. Even though the project was initiated as a tabula rasa, it appears that, in the future, they want to keep a link to the past. Image: A guest house inspired by a bird's nest, Credit: Koryo Group. Image: Bird's Nest Interior, Credit: Koryo Group. Image: Bird's Nest Room, Credit: Koryo Group. North Korea is one of the least-visited countries in the world, but certainly one of the most fascinating. We set up Koryo Tours in 1993 and have been running trips to North Korea every month since then. Koryo Tours practices responsible tourism and much of our work is to do with cultural, sports and educational engagement. It would be very difficult to isolate the country more than it already is – no internet or phone access outside of the country, for example – so we get involved in projects that engage the local people, such as film-making (our feature film "Comrade Kim goes Flying" is North Korea's first girl-power film), taking Middlesbrough Women's Football Team to play against the North Korean army team, as well as humanitarian projects, too. Image: A flying residence for holidays on the go, Credit: Koryo Group. Has Koryo's ability to bring design books into North Korea had any impact on architecture or design? Nick Bonner: We have spent 21 years engaging with North Korea through film, art and tourism, and yes, we have had an impact by providing a visual stimulus, something different and fresh. However, it still remains a design community basically cut off from outside influences. Image: An improved rail system, Credit: Koryo Group.